The International Covenant on Civil and Political Rights (ICCPR) is an international human rights treaty adopted by the United Nations (UN) in 1966. It is one of the two treaties that give legal force to the Universal Declaration of Human Rights (the other being the International Covenant on Economic, Social and Cultural Rights, ICESCR). ICCPR commits the states signed up to it to protect and respect the civil and political rights of individuals. The UK ratified ICCPR in 1976. The full text of ICCPR can be found here. Each treaty operates on its own unique timetable. We are now in a period of follow-up activity for the ICCPR where we will be working the government and civil society organisations to try and implement the committee's concluding observations. The Commission’s follow-up report (Welsh language version) regarding the concluding observations adopted by the Human Rights Committee on the seventh periodic report of the UK (July 2016). The Commission’s report on the UK’s implementation of the International Covenant on Civil and Political Rights (May 2015). Submission to the United Nations Human Rights Committee Pre-Sessional Working Group on the United Kingdom’s Implementation of the International Covenant on Civil and Political Rights (July 2014). Research project on religion and belief in the workplace (March 2015). Legal guidance on freedom of expression (February 2015). Mid-Term Universal Periodic Review Report (August 2014). Submission to the UN Committee against Torture: response to list of issues on the UK's fifth periodic report (August 2012). Publication of the UK Government’s follow-up report, date of publication yet to be announced. What are the current ICCPR issues for the UK? review the surveillance laws so that any interference with the right to privacy is legal, proportionate and necessary. The Human Rights Committee’s Concluding Observations on the UK can be found on the UN website. The ICCPR is monitored by the UN’s Human Rights Committee, a body made up of 18 independent experts from around the world. When a State party has first ratified ICCPR, it must provide information on the legal and practical measures it has taken to implement all the substantial articles in the Covenant. The State party will then submit periodic reports approximately every four years. After ratifying ICCPR, the UK must report on the legal and practical measures taken to implement its core obligations. It then submits progress reports approximately every four years (known as ‘State Reports’). At least one year before the State Report is due, the Human Rights Committee provides the UK Government with a list of issues that must be covered within it. Find out more about this procedure on the UN website. Read the UK’s most recent State Report. Read the UK’s reply to the Human Rights Committee’s list of issues. 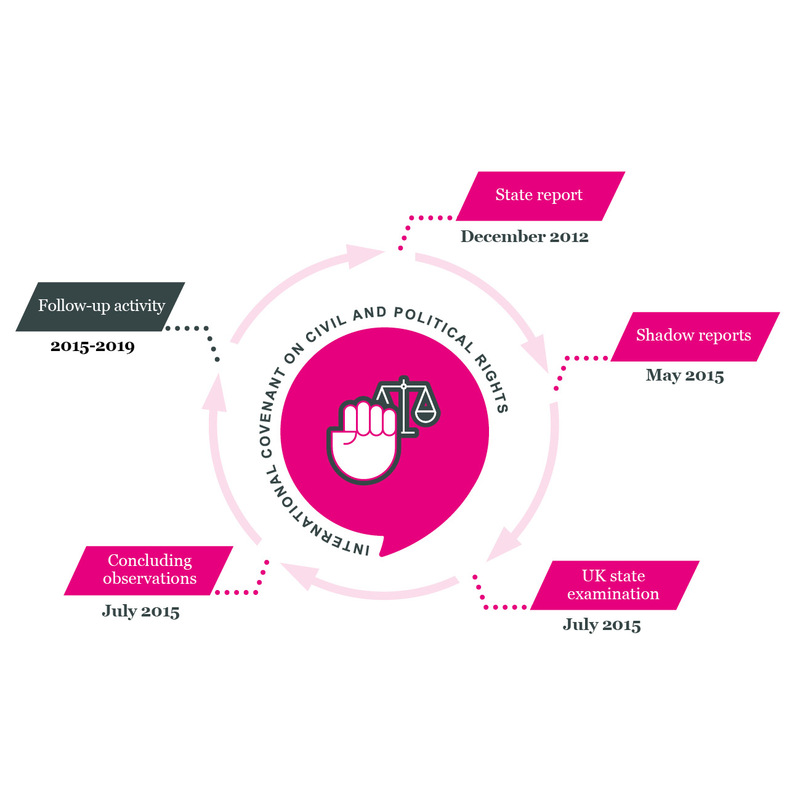 Read more about the ICCPR monitoring process. What else does the UN Human Rights Committee do? right to equality before courts and tribunals and the right to a fair trial. See an example of general comment.